​​​ AUSTIN – The American dream of owning a home may be slipping even further away for many people in Austin. KVUE has been investigating the issue and found that while the sky seems to be the limit for home prices in th​e city; salaries can't keep up and it's pushing people out of town. ​According to federal housing data housing prices have risen faster in Austin than anywhere else in the country. But the real issue isn't just a need for housing. Instead, the salaries that most people in Austin receive is not enough to keep up with the price hikes. Over the last 26 years in the city, family incomes rose 97 percent. At the same time, median home prices rose 290 percent. 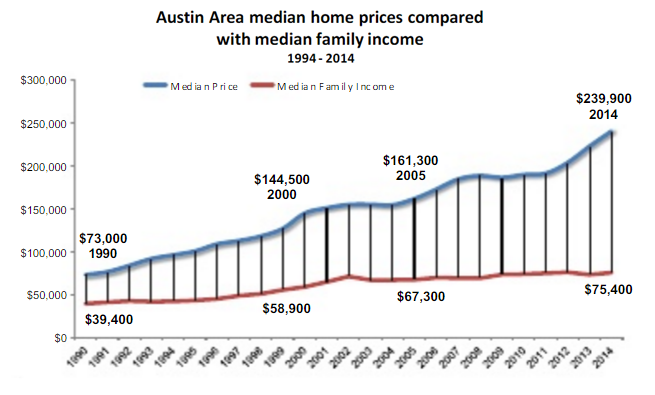 Put another way, a family making $50,000 in Austin would have seen their income rise to $98,500. However, a home that cost $100,000 then would now cost $390,000. Within Austin, these five zip codes have the fastest rising prices—the areas once considered affordable—mostly in East and Southwest Austin. It's not an isolated trend in Austin, statewide prices are increasing at a rate that wages can't keep up with, but Austin still far outpaces the larger cities like Dallas, Houston, and San Antonio. ​W​ant other information? Check out Austin Housing Market Research and Austin Employment Market Research.